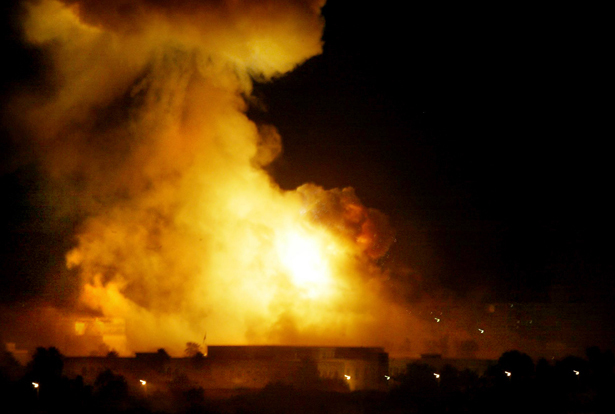 On the tenth anniversary of the US invasion, the country is mired in a permanent crisis of sectarian violence, pervasive corruption and broken infrastructure. Ten years ago, Iraqis, even if they had originally opposed them, hoped that the US invasion and occupation would at least bring an end to the suffering they had endured under UN sanctions and other disasters stemming from defeat in the first Gulf War in 1991. Today, people in Baghdad complain that they still live in a permanent state of crisis because of sectarian and criminal violence, pervasive corruption, a broken infrastructure and a dysfunctional government. Many Iraqis say that what they want in 2013 is the same as what they wanted in 2003, which is a visa enabling them to move to another country, where they can get a job. Patrick Cockburn first visited Iraq in 1977 and has written three books on the country and its leaders. He recently completed a tour of all parts of Iraq. Baghdad was once a city where Sunni, Shiite and Christian lived side by side, conscious that they belonged to different sects but not frightened of one another. This all changed during the 2006–08 civil war, during which, at its peak, more than 3,700 Iraqis died in a single month, the great majority of them in Baghdad. “There are not many mixed areas left today,” says a Shiite woman who lives with her mother in a Sunni-majority district and tries to hide her sectarian identity from her Sunni neighbors. At the moment, she is worried that she may be asked to give evidence against one of these neighbors, who is in prison charged with murdering a Shiite man five years ago. She suspects he also left a round of ammunition in front of her house as a threat. She does not want to give evidence against him, as it would become obvious she is a Shiite, leaving her open to retaliation. The sectarian civil war was at its most intense in Baghdad and the central provinces of Iraq, where a third of the country’s 33 million people live. It ended with a decisive defeat for the Sunnis, who were driven out of most of east Baghdad, and in west Baghdad were compressed into several large enclaves surrounded by Shiite neighborhoods. Iraqi friends say blithely that “everything is safe now,” but they don’t act as if they really believe it. They become nervous when they enter hard-core areas controlled by another community or, if living in a mixed district, they panic if there is the slightest threat, such as a hostile slogan on a wall or an anonymous leaflet. After what happened before, nobody is going to take a chance. Even today, there is a constant drumbeat of bombings and assassinations; 220 Iraqis were killed and 571 injured in February alone. Ali Abdul-Karim, a successful real estate broker, told me he thought people were too quick to flee on hearing a rumor. But he went on to speak about the problems besetting a property sale he is trying to arrange that underline the dangerous complexities of living in Baghdad. He said his client in this case is a former intelligence captain under Saddam Hussein. He owns a bee farm in a notoriously violent Sunni area on the southern fringes of Baghdad called Arab Jabour. The captain moved out of the area because he was threatened by Al Qaeda for refusing to cooperate with them, but his 80-year-old father refuses to leave the farm. In the meantime, the captain has been imprisoned by the government because of his former membership in Saddam’s secret police. A problem in understanding present-day Iraq is that US military successes after 2007 were exaggerated to make the final military withdrawal at the end of 2011 look less like a confession of failure. The surge—the offensive by 30,000 US reinforcements in 2007—was lauded by the Western media at the time for stopping a civil war and defeating the Sunni insurgents, though in reality it was a good deal less than that. In practice, the establishing of US outposts and the building of dozens of kilometers of concrete-slab walls during the surge simply froze in place the new sectarian map of Baghdad, leaving the Shiites dominant. Their territory is easily identifiable because of Shiite religious banners flying from the tops of buildings and posters showing Shiite leaders and martyrs, such as Muqtada al-Sadr and his father or Imam Ali and Imam Hussein, pasted to every wall. The banners and posters are not just attached to civilian houses, but to military and police checkpoints, security headquarters, even prisons. They leave no doubt about which sect runs the government. This is important, not least because the government payroll totals 3 million people. Paying these employees absorbs a large part of the government’s $100 billion a year in oil revenues. Access to political influence is critical for getting a job—though a bribe is usually necessary as well—in a country where at least a third of the working population is unemployed. The system works like a gigantic Tammany Hall machine, in which jobs are distributed according to party allegiance regardless of merit. Every ministry is the fiefdom of one party or another that rigorously excludes other parties or members of other communities. Overall, the Shiites are included and the Sunnis excluded. One Sunni friend has a job in a ministry where bribe-taking in return for official permits is the norm. He swears he does not take bribes, but says that because other workers in his administrative section are Shiite, “I am the one who is likely to be charged with corruption.” He plans to switch jobs as quickly as he can. There is a grandeur in the blatancy and pervasiveness of corruption at every level in Iraq. People in prison found innocent at their trial must still pay to get released. Officers who want promotion in the army or police must pay. A civilian friend worked out that he could join the army and rise to the rank of colonel within months, but he would have to bribe eleven people to do so. One former minister describes the system as “institutionalized kleptocracy.” The government of Nouri al-Maliki, prime minister since 2006, allocates contracts to supporters and to political factions he wants to cultivate. Money is paid for contracts regardless of whether they are performed or not. The effects can be seen all over Baghdad, where there are almost no new buildings. I was there recently during a couple of days of heavy rain. Since 2003, $7 billion has been spent on a new sewage system, which should have taken care of the rainwater. But it turns out that either there are no new sewers or they don’t work, because within hours, the streets of Baghdad turned into murky gray pools of water and sewage. Electricity is often two hours on, two hours off, and there is a shortage of clean water. The rise of a state so parasitic on its people has much to do with the actions of the United States before rather than after the 2003 invasion. The destruction of the Iraqi economy and society had begun thirteen years earlier, in 1990, when UN sanctions were imposed, at US urging, after Saddam invaded Kuwait. They amounted to a merciless, thirteen-year economic siege that did not lead to the overthrow of Saddam but did reduce millions of Iraqis to poverty. The health and education services collapsed and crime became rife. The Oil for Food program during that period supposedly permitted essential supplies to reach Iraq, but they were never enough. In 1996, I visited a village called Penjwin in Iraqi Kurdistan, beyond Saddam’s control, where people had been reduced to trying to survive by defusing and extracting the explosive from a highly dangerous jumping mine called the Valmara. They would sell the explosive, and the aluminum foil it was wrapped in, for a few dollars. Many villagers were missing hands or feet. Because of sanctions, Iraqi society was already in a state of dissolution when the United States invaded in 2003. Its collapse was kept in check only by the brutal discipline of Saddam’s rule. When that was removed, there was a social revolutionary ferocity in the looting of Baghdad. A former senior official there said that “Iraq has ended up living under a system that combines some of the worst elements of rule by Saddam Hussein and the US occupation.” It will take a long time to recover. Jonathan Schell examines the unbroken record of waste, futility and shame of the Iraq invasion, ten years later.